South Africa appears to be at a crossroads in defining its foreign policy priorities; particularly in terms of its peace and security engagements in Africa. On the one hand, the country still places peace and security engagements at the core of its priorities in the continent. On the other hand, its approaches to peace and security are increasingly being questioned. This comes at a time when there is a growing drive to bring prevention to the core of global responses to conflict; the result of an increasing realisation that such responses need to become more proactive, inclusive and ultimately more effective. 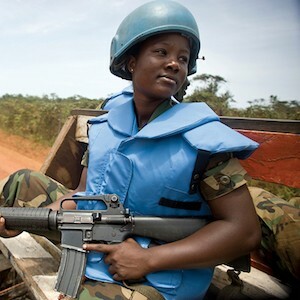 Acknowledging that the international community has not reached the potential of its peace and security tools, theUnited Nations (UN) conducted three reviews on its approaches to peace operations, peacebuilding and women, peace and security last year. South Africa has long advocated for better use of conflict-prevention mechanisms internationally, including for tools like mediation, peacekeeping and peacebuilding support to be better integrated. South Africa could therefore become a more active player in assisting the UN and AU as the organisations rethink their conflict-prevention initiatives. South Africa could also assume a more important role in preventing the outbreak of conflicts on the continent. Since its political transition in the 1990s, Pretoria’s foreign policy has been built on principles of solidarity, pan-Africanism and internationalism. In particular, South Africa has highlighted its soft power as a means of engaging the continent. Between the late 1990s and late 2000s, South Africa’s responses to conflict in places such as Burundi, Sudan and the Democratic Republic of Congo (DRC), saw a wide range of tools being used. These included mediation, the deployment of peacekeepers and direct technical and financial assistance. In these responses, South Africa was able to draw on its own experiences, including the setting up of a Truth and Reconciliation Commission, and the process of developing the constitution. These have often been used as entry points for initiatives and engagements on the continent. In the past decade, however, there has been less clarity on the direction South Africa’s foreign policy is taking. Its roles in DRC and Burundi in the 2000s, while not perfect, notably followed a somehow integrated approach. More recently, South African engagements in countries like Central African Republic often became more limited and less connected to a sustained and continued engagement. Historically, South Africa has engaged extensively in operational approaches to conflict prevention, having implemented various activities aimed at directly stopping existing violence. Generally conducted in the context of peacemaking responses, these activities have included mediation, good offices and dialogue. It also included an active role in deploying peacekeepers, including in the Force Intervention Brigade to fight the M23 group in the DRC. South Africa has been active in supporting the development of early response initiatives, like the African Standby Force and the African Capacity for Immediate Response to Crisis – but like the rest of the continent, has faced challenges in ensuring its effective and timely implementation. More recently, South Africa’s participation in peacekeeping operations has visibly decreased – both at the UN and AU levels. This year, the number of South African uniformed personnel deployed to peace operations reached the lowest level since the early 2000s, following the withdrawal of its soldiers from Darfur, Sudan. Regarding longer-term approaches to conflict prevention, South Africa has been less consistent in its structural support to addressing root causes of conflict. South Africa might have played a pivotal role in the transitional processes of Burundi and the DRC in the early 2000s, but its voice and role in the 2015 Burundi election crisis and the looming political crisis in the DRC have been less evident. It has also been far more reactive than proactive in developing conflict prevention responses, and its responses often had a limited time-span. In principle, South Africa’s foreign policy still acknowledges that diverse responses must be implemented as part of its efforts to prevent conflicts. The draft white paper on foreign policy directly acknowledges links between development and peace, where it stipulates that intra-state conflicts continue to frustrate sustainable development in Africa. In practice, however, South Africa must unpack and clarify its various conflict prevention narratives: from engagement and support to political processes and dialogue, to the deployment of peacekeepers and support to peacebuilding processes. South Africa cannot do everything, and so it has to define where its strengths are. In this way, it will increase its focus and additionally show how specific engagements can work to prevent conflict. South Africa’s role as a champion in conflict prevention has come under scrutiny. Peace and justice are fundamentally connected, forming a basis for structural and long-term responses that can truly help countries to sustain peace. Once a well-known advocate for measures on international justice, South Africa has since been widely criticised for notifying the United Nations (UN) Secretary-General of its intention to pull out of the International Criminal Court (ICC). It is fair to say that South Africa’s peace operations and peacebuilding responses have delivered mixed results, and have not dealt effectively with emerging threats, nor enhanced the potential to achieve sustainable peace. For years, South Africa used its engagements in Burundi as a poster child in this regard. It now becomes clear that more could have been done to sustain its efforts and avoid the relapse of violence. The 2015 reviews argue that the common confusion, fragmentation and ‘silos’ that typify responses to conflict are not just costly, but also reduce the overall impact of peace and security efforts. This is an important lesson for South Africa. To increase its relevance, South Africa must identify a clear strategy, work with civil society and academia, gain trust and drive the solutions through multilateral organisations. Countries often see engagement in conflict prevention as part of a pragmatic approach, where the international community is expected to do more, with fewer resources. As a result, countries like South Africa should play an active role in defining its own strategies for conflict prevention, reducing the risk of it becoming side-lined and underfunded at a global level. This ISS Today is partially based on discussions held at a seminar jointly organised by the ISS and the Danish Embassy in Pretoria, on 11 October 2016, entitled A New International Momentum for Conflict Prevention: Opportunities and Lessons from South Africa.